Hi there! 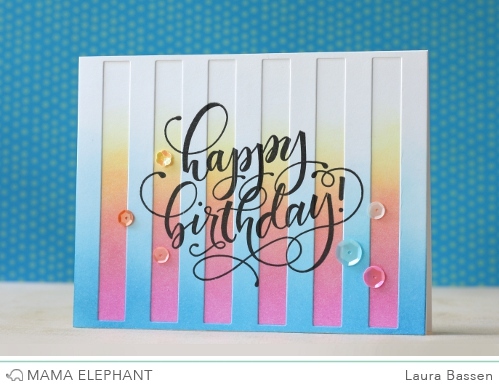 Laura here and today I have a project featuring the Birthday Wishes stamp set as well as the Classic Stripe Cover creative cut. I blended several Mama Elephant pigment inks to add color to my two panels. After stamping the birthday sentiment on both panels, I die cut the blue panel with with the Classic Strip Cover die and then adhered it over top of the pink panel, lining up the sentiments to look as one. This is such a cool effect and really showcases both the gorgeous scripty sentiment as well as the fun strip cover die. That's all for today. Thanks so much for stopping by! Love it! Those ink colors are gorgeous, and I love Laura's commentary...redneck version of a MISTI - hahahaha. I love the colors. What a beautiful card! I have also been holding off on the Misti but since I have a birthday coming up.... I think I know what I will ask for from my wonderful husband. What an absolutely gorgeous card!! Love the card, very impressive! 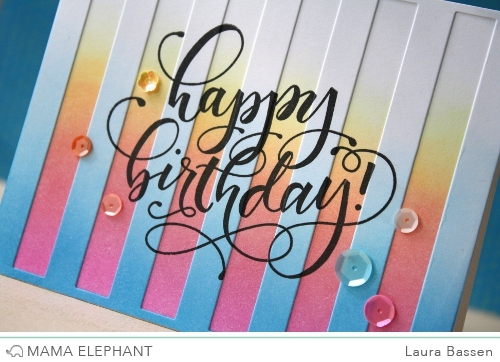 Gorgeous font on this sentiment and I love how Laura showcased it with the Cover Die...So pretty! I’m sending you warmest wishes and visit this website special thoughts, because it’s your birthday, and because you’re you!